Managing process versions gives you flexibility implement improvements that result from performance analysis of your processes and the company’s continuous improvement process. Developments and improvements proposed for the processes in Production must be evaluated before implementing them to see whether they require the creation of a new version of the process to guarantee the compatibility of the functions in Production, that is, open cases must end with the version of the process they were created in. In-flight process instances will keep running in the version in which they were created. When a new version of a process is taken to Production, new instances will be created in the new version. The following table lists some common scenarios of required adjustments to processes in Production. 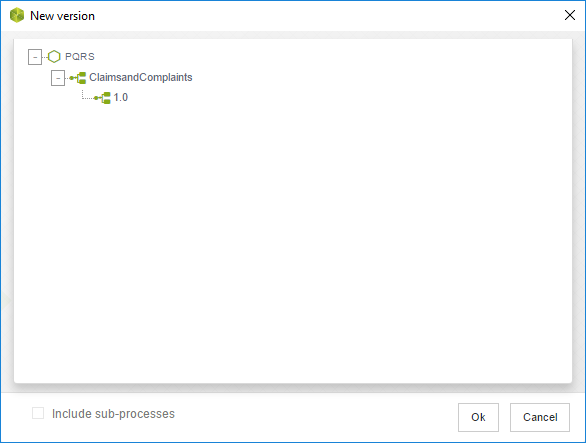 Any change in the process flow: include or delete shapes in a process flow, change names of shapes, change task duration, automatic notifications, etc. Include or delete attributes (or controls in forms) that will be evaluated later in a business rule. Include or delete attributes with no relevant information in forms, or with information that will not be evaluated in a business rule. Change rules that will be evaluated at a certain point of the process and can produce errors for in-flight cases. Change rules that have no impact (will not produce errors) on in-flight processes. Changes to On Enter, On Exit, On Save actions or business rules that determine the routing of the process workflow. Changes to On Enter, On Exit, On Save actions that do not affect process logic. New path added to the process after Inclusive or Exclusive Gateways. 1. Evaluate if you need a new version of a process according to the guidelines above or wether you can edit in the Production environment directly, as described at Continuous improvement and development after a deployment. 2. 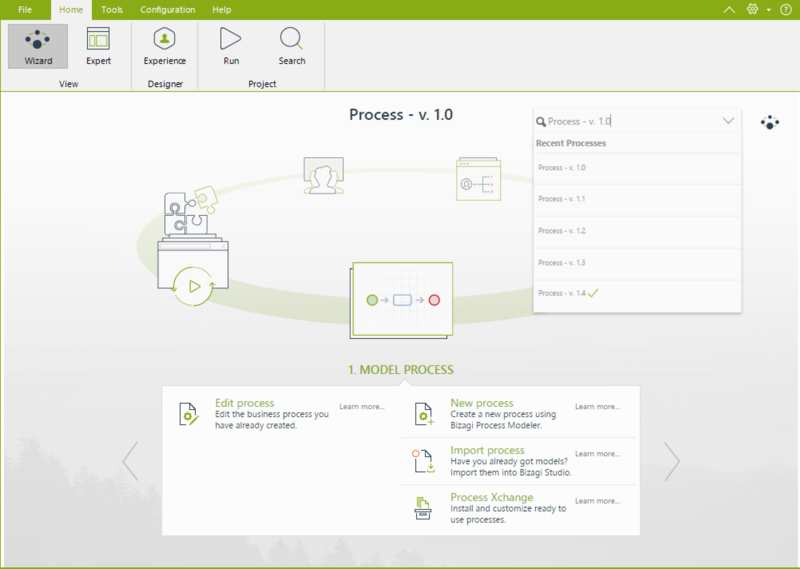 Bizagi lets you to clone a process to start a new process based on a the existing one. If you need to improve the latest (newest) version of a process, create a newer version of the latest version. Consider cloning a process to create a new one, that is based on common things with the original. 3. Make sure your process is not checked-out by any user before creating a new process version. For more information, refer to Process in Expert View. 4. We recommend that you make backups of the database before creating a new process version. 1. Bizagi duplicates components such as Forms, Policies, Expressions, Vocabulary, Templates and elements in every process version/copy created. 2. Bizagi shares the same definition for Global Vocabulary, Expressions and Policies between different process versions/copies. Thus, they will not be copied. 3. When you clone a process that has multiple versions, Bizagi only clones the latest version; previous versions will be ignored. 4. During creation of a new version or during cloning of a process, end users cannot use the Work Portal because all services will be stopped. 1. In the Expert View right-click on the version of the process you want to version. 2. A new window displays the structure of the application that contains the process. 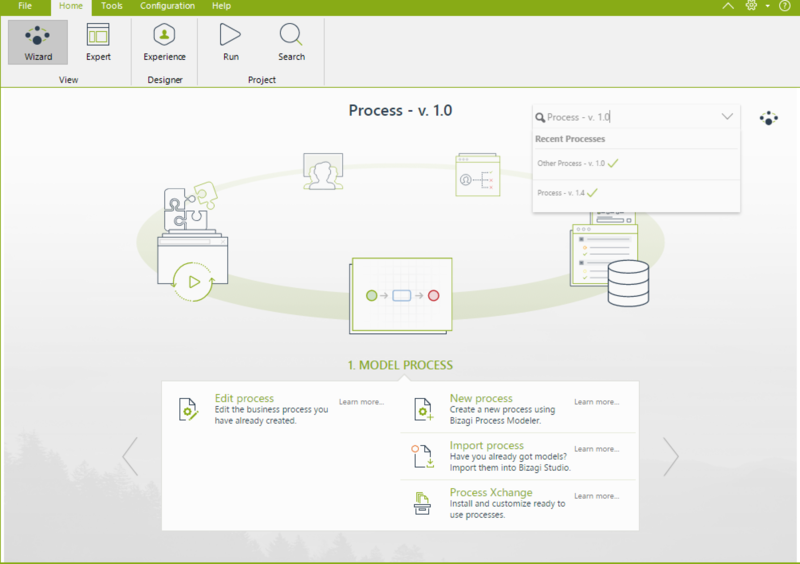 Select the exact version of the process or processes that will be generated as a new version. 3. We strongly recommend that you click the Advance button at the bottom left corner. This lets you create new versions of the Sub-processes. The new process version will use the new Sub-processes and the new forms version to preserve the previous versions intact. 4. Click New Version to start creating the new version of the process. A window displays the status of the process. As soon as the process is finished you see a confirmation message. You are now ready to work on your new version through the Wizard view. Only objects related to the process are copied: Phases, Activities, Transitions, Intermediate Event, Forms, Rules etc. Shared objects like: Entities (Attributes), Entity Forms are not copied. If the process falis, an error window displays a message about the problem. Correct the error and start again. 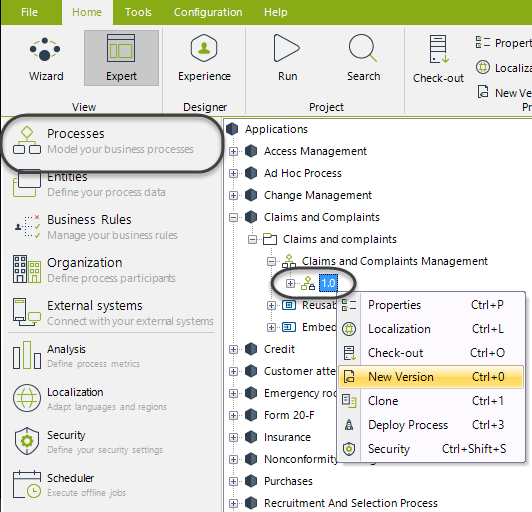 Once you've created several versions of your processes, your process drop-down list in the Wizard view can get very cluttered and hard to navigate. To avoid this Bizagi lets you hide all the inactive version of a process. Simply click the option Hide inactive process versions. This will change the color of the slider to green and eliminate all the inactive process versions of the Recent Process list.